Discussion in 'iPhone' started by KingArthurVI, Oct 4, 2014. SEOUL, South Korea (AP) — North Korea's presumptive No. 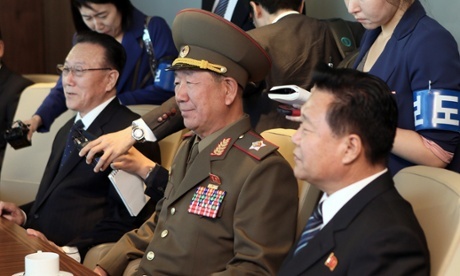 2 and other members of Pyongyang's inner circle met with South Korean officials Saturday in the rivals' highest level face-to-face talks in five years, a possible indication that both sides are interested in pursuing better ties after months of animosity. There appeared to be no major breakthrough from the meeting that came as the North's delegation made a surprise visit to the close of the Asian Games in the South Korean port city of Incheon. But the countries agreed to hold another round of talks between the end of October and the beginning of November, according to a South Korean statement. The specific topics of Saturday's discussions weren't immediately known. What is my suggested next course of action!? I fail to follow your logic that North Korea delayed your phone. I blame Kim Jong Un. what the heck is that yellow stuff hes looking at? Allegedly it's industrial lube or something.. but it's probably food for the peasants he tortures and imprisons. Nothing. You are the victim of something known as Force Majeure. if the North Koreans want to visit and that shuts down airspace, all you can do is wait until they leave. Geez that explains a lot. Learned a new word today too. Is this a joke? You're course of action is to sit and wait...what do you expect? I suggest you immediately travel to North Korea and demand to see Kim Jong Un and complain to him. Of course it is a joke, sheesh. lol. You never know around these forums...you hear some pretty stupid stuff. Lil' Kim is bending your phone at this very moment and will then send it to a labor camp. Actually, it's beginning to look like maybe Li'l Kim himself could be in a labor camp. Bending iPhones. I expect to see a state funeral very soon filmed at 240fps on an iPhone 6. Korean kimchi version of udon noodles lol..
Really? Your next course of action is to wait..... May I also suggest sterilization. 1. Open UPS tracker page. 4. Hit refresh repeatedly at least 60 times a minute. 5. Make some more popcorn when you finish that popcorn. 6. Repeat steps 4 and 5 till you receive your phone. Steps 4 and 5 are have helped countless people on this forum since the deliveries started. It is a sure shot. Once mine shipped it took 4 days to get to Incheon, so, blah. Really? You sir can't take a joke.